Let&apos;s go Bolts, Let&apos;s go Bolts, Let&apos;s go Bolts!!!!! Lisa here with your Sweep recap of the Lightning&apos;s last four games. Let&apos;s rewind to not even a week ago and get this party started. The first game of this series was on Friday, April 29th in Washington DC. We managed to win that game with a comfortable score of 4-2. Goals being scored by Bergenheim, Downie, Stamkos, and Moore; with Roloson in goal. The second game in DC took place on Sunday, May 1st. Lecavalier is to be thanked for our win in overtime that evening. He also scored one other goal as did St. Louis. Clearly Roloson was still in goal. Then the series came back to Tampa Bay, and the St. Pete Times Forum on Tuesday, May 3rd. We won this game with the help of Bergenheim, Lecavalier, Stamkos and Malone. Roloson played an amazing game, and we could not have won without him. Last nights game was the end of it all with a 5-3 win, including an empty net goal at the end (those are my favorites). Malone, Bergenheim (Scored twice), Begeron, and St. Louis all scored; with Roloson lead the Tampa Bay Lightning to victory, and a series sweep. I was perusing the Tampa Bay Lightning website today, looking for St. Pete Times Forum Tickets to the next series and learned a few things I want to share with you. First of all tickets are not on sale yet because we don&apos;t know who we will be playing. The beauty of sweeping is that you get done early, which gives the players time to practice and rest so they are ready for the next round. Right now we are waiting for the winner of the Boston vs. Philadelphia series to be crowned, and currently Boston is up 3 games to 0. Their next game is Friday, so that is the earliest we will know who we play. 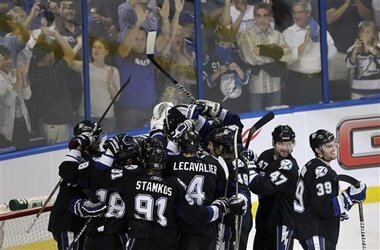 The second thing I learned on the Tampa Bay Lightning website is this statistic, and it literally made my jaw drop; "Dwayne Roloson&apos;s current 6 game winning streak is the second-longest ever in one playoff year by a goaltender who is at least 40 years old, behind only Jaques Plante who won eight straight playoff games for the St. Louis Blue in 1969 at age 40." So here&apos;s to you Dwayne Roloson, without whom we would not be sweeping up the competition. That&apos;s all for now Tampa, but I&apos;m sure I&apos;ll be back soon with other Tampa Florida News!